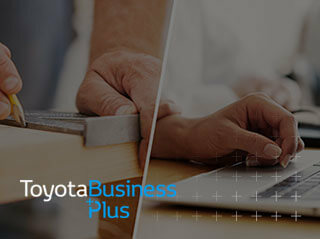 Because each Fleet customer is unique, Toyota BusinessPlus offers a range of financial solutions that can be tailored according to your individual needs. Our dedicated Business team can guide you on the most cost effective ways to acquire your business vehicles. *Business users only. Initial rental and VAT applies. Available on new leases of model shown when ordered and proposed for finance between 1st April 2019 and 30th June 2019, registered and financed by 30th September 2019 through Toyota Financial Services on Toyota Contract Hire. Advertised rental is based on a 36 month customer maintained contract at 8,000 miles per annum with an initial rental of £912 +VAT. Excess mileage charges apply. You will not own the vehicle. Other finance offers are available but cannot be used in conjunction with this offer. Offer may be varied or withdrawn at any time. At participating Toyota Centres. Toyota Centres are independent of Toyota Financial Services. Indemnities may be required. Finance subject to status to over 18s only. Toyota Financial Services is a trading name of Toyota Financial Services (UK) PLC; registered Office: Great Burgh, Burgh Heath, Epsom, KT18 5UZ. Authorised and regulated by the Financial Conduct Authority. Terms and conditions apply. *Business users only. Initial rental and VAT applies. Available on new leases of model shown when ordered and proposed for finance between 1st April 2019 and 30th June 2019, registered and financed by 30th September 2019 through Toyota Financial Services on Toyota Contract Hire. Advertised rental is based on a 36 month customer maintained contract at 8,000 miles per annum with an initial rental of £1,416 +VAT. Excess mileage charges apply. You will not own the vehicle. Other finance offers are available but cannot be used in conjunction with this offer. Offer may be varied or withdrawn at any time. At participating Toyota Centres. Toyota Centres are independent of Toyota Financial Services. Indemnities may be required. Finance subject to status to over 18s only. Toyota Financial Services is a trading name of Toyota Financial Services (UK) PLC; registered Office: Great Burgh, Burgh Heath, Epsom, KT18 5UZ. Authorised and regulated by the Financial Conduct Authority. Terms and conditions apply. *Business users only. Initial rental and VAT applies. Available on new leases of model shown when ordered and proposed for finance between 1st April 2019 and 30th June 2019, registered and financed by 30th September 2019 through Toyota Financial Services on Toyota Contract Hire. Advertised rental is based on a 36 month customer maintained contract at 8,000 miles per annum with an initial rental of £1,308 +VAT. Excess mileage charges apply. You will not own the vehicle. Other finance offers are available but cannot be used in conjunction with this offer. Offer may be varied or withdrawn at any time. At participating Toyota Centres. Toyota Centres are independent of Toyota Financial Services. Indemnities may be required. Finance subject to status to over 18s only. Toyota Financial Services is a trading name of Toyota Financial Services (UK) PLC; registered Office: Great Burgh, Burgh Heath, Epsom, KT18 5UZ. Authorised and regulated by the Financial Conduct Authority. Terms and conditions apply. *Business users only. Initial rental and VAT applies. Available on new leases of model shown when ordered and proposed for finance between 1st April 2019 and 30th June 2019, registered and financed by 30th September 2019 through Toyota Financial Services on Toyota Contract Hire. Advertised rental is based on a 36 month maintenance included contract at 8,000 miles per annum with an initial rental of £1,524 +VAT. Excess mileage charges apply. You will not own the vehicle. Other finance offers are available but cannot be used in conjunction with this offer. Offer may be varied or withdrawn at any time. At participating Toyota Centres. Toyota Centres are independent of Toyota Financial Services. Indemnities may be required. Finance subject to status to over 18s only. Toyota Financial Services (UK) PLC. Registered Office: Great Burgh, Burgh Heath, Epsom, KT18 5UZ. Authorised and regulated by the Financial Conduct Authority. Terms and conditions apply. ^Maintained Contract Hire keeps your business moving. We include all routine servicing, replace worn tyres and give peace of mind with AA Roadside Assistance. Model shown is MY19 Active 5 door 1.8 VVT-i Auto £25,040 including optional Pearlescent paint at £795. Prices correct at time of being published. 5 year/100,000 mile manufacturer warranty. Terms and conditions apply. *Business users only. Initial rental and VAT applies. Available on new leases of model shown when ordered and proposed for finance between 1st April 2019 and 30th June 2019, registered and financed by 30th September 2019 through Toyota Financial Services on Toyota Contract Hire. Advertised rental is based on a 36 month customer maintained contract at 8,000 miles per annum with an initial rental of £1,344 +VAT. Excess mileage charges apply. You will not own the vehicle. Other finance offers are available but cannot be used in conjunction with this offer. Offer may be varied or withdrawn at any time. At participating Toyota Centres. Toyota Centres are independent of Toyota Financial Services. Indemnities may be required. Finance subject to status to over 18s only. Toyota Financial Services is a trading name of Toyota Financial Services (UK) PLC; registered Office: Great Burgh, Burgh Heath, Epsom, KT18 5UZ. Authorised and regulated by the Financial Conduct Authority. Terms and conditions apply. *Business users only. Initial rental and VAT applies. Available on new leases of model shown when ordered and proposed for finance between 1st April 2019 and 30th June 2019, registered and financed by 30th September 2019 through Toyota Financial Services on Toyota Contract Hire. Advertised rental is based on a 36 month customer maintained contract at 8,000 miles per annum with an initial rental of £1,278 +VAT. Excess mileage charges apply. You will not own the vehicle. Other finance offers are available but cannot be used in conjunction with this offer. Offer may be varied or withdrawn at any time. At participating Toyota Centres. Toyota Centres are independent of Toyota Financial Services. Indemnities may be required. Finance subject to status to over 18s only. Toyota Financial Services is a trading name of Toyota Financial Services (UK) PLC; registered Office: Great Burgh, Burgh Heath, Epsom, KT18 5UZ. Authorised and regulated by the Financial Conduct Authority. Terms and conditions apply. *Business users only. Initial rental and VAT applies. Available on new leases of model shown when ordered and proposed for finance between 1st April 2019 and 30th June 2019, registered and financed by 30th September 2019 through Toyota Financial Services on Toyota Contract Hire. Advertised rental is based on a 36 month customer maintained contract at 8,000 miles per annum with an initial rental of £1,452 +VAT. Excess mileage charges apply. You will not own the vehicle. Other finance offers are available but cannot be used in conjunction with this offer. Offer may be varied or withdrawn at any time. At participating Toyota Centres. Toyota Centres are independent of Toyota Financial Services. Indemnities may be required. Finance subject to status to over 18s only. Toyota Financial Services is a trading name of Toyota Financial Services (UK) PLC; registered Office: Great Burgh, Burgh Heath, Epsom, KT18 5UZ. Authorised and regulated by the Financial Conduct Authority. Terms and conditions apply. Model shown is Prius Plug-In Business Edition Plus 5 door 1.8 VVT-i Auto at £32,240 including optional metallic paint at £545. Prices correct at time of being published. 5 year/100,000 mile manufacturer warranty. Terms and conditions apply. *Business users only. Initial rental and VAT applies. Available on new leases of model shown when ordered and proposed for finance between 1st April 2019 and 30th June 2019, registered and financed by 30th September 2019 through Toyota Financial Services on Toyota Contract Hire. Advertised rental is based on a 36 month customer maintained contract at 8,000 miles per annum with an initial rental of £1,944 +VAT. Excess mileage charges apply. You will not own the vehicle. Other finance offers are available but cannot be used in conjunction with this offer. Offer may be varied or withdrawn at any time. At participating Toyota Centres. Toyota Centres are independent of Toyota Financial Services. Indemnities may be required. Finance subject to status to over 18s only. Toyota Financial Services is a trading name of Toyota Financial Services (UK) PLC; registered Office: Great Burgh, Burgh Heath, Epsom, KT18 5UZ. Authorised and regulated by the Financial Conduct Authority. Terms and conditions apply. Model shown is Hilux Invincible X 3.2t 2.4D 150 DIN hp Automatic at £37,750 including met paint at £545. Prices correct at time of being published. 5 year/100,000 mile manufacturer warranty. Terms and conditions apply. *Business users only. Initial rental and VAT applies. Available on new leases of model shown when ordered and proposed for finance between 1st April 2019 and 30th June 2019, registered and financed by 30th September 2019 through Toyota Financial Services on Toyota Contract Hire. Advertised rental is based on a 36 month customer maintained contract at 8,000 miles per annum with an initial rental of £2,070 +VAT. Excess mileage charges apply. You will not own the vehicle. Other finance offers are available but cannot be used in conjunction with this offer. Offer may be varied or withdrawn at any time. At participating Toyota Centres. Toyota Centres are independent of Toyota Financial Services. Indemnities may be required. Finance subject to status to over 18s only. Toyota Financial Services (UK) PLC. Registered Office: Great Burgh, Burgh Heath, Epsom, KT18 5UZ. Authorised and regulated by the Financial Conduct Authority. Terms and conditions apply. Model shown is PROACE Verso family Medium 2.0 Diesel 150 DIN hp Manual at £37,020 including optional metallic paint at £545. Prices correct at time of being published. 5 year/100,000 mile manufacturer warranty. Terms and conditions apply. *Business users only. Initial rental and VAT applies. Available on new leases of model shown when ordered and proposed for finance between 1st April 2019 and 30th June 2019, registered and financed by 30th September 2019 through Toyota Financial Services on Toyota Contract Hire. Advertised rental is based on a 36 month customer maintained contract at 8,000 miles per annum with an initial rental of £1,524 +VAT. Excess mileage charges apply. You will not own the vehicle. Other finance offers are available but cannot be used in conjunction with this offer. Offer may be varied or withdrawn at any time. At participating Toyota Centres. Toyota Centres are independent of Toyota Financial Services. Indemnities may be required. Finance subject to status to over 18s only. Toyota Financial Services is a trading name of Toyota Financial Services (UK) PLC; registered Office: Great Burgh, Burgh Heath, Epsom, KT18 5UZ. Authorised and regulated by the Financial Conduct Authority. Terms and conditions apply. *Business users only. Initial rental and VAT applies. Available on new leases of model shown when ordered and proposed for finance between 1st April 2019 and 30th June 2019, registered and financed by 30th September 2019 through Toyota Financial Services on Toyota Contract Hire. Advertised rental is based on a 36 month maintenance included contract at 8,000 miles per annum with an initial rental of £2,214 +VAT. Excess mileage charges apply. You will not own the vehicle. Other finance offers are available but cannot be used in conjunction with this offer. Offer may be varied or withdrawn at any time. At participating Toyota Centres. Toyota Centres are independent of Toyota Financial Services. Indemnities may be required. Finance subject to status to over 18s only. Toyota Financial Services (UK) PLC. Registered Office: Great Burgh, Burgh Heath, Epsom, KT18 5UZ. Authorised and regulated by the Financial Conduct Authority. Terms and conditions apply. Model shown is Land Cruiser Invincible 2.8 Diesel 177 DIN hp Automatic at £54,795 including optional metallic paint at £700. Prices correct at time of being published. 5 year/100,000 mile manufacturer warranty. Terms and conditions apply. *Business users only. Initial rental and VAT applies. Available on new leases of model shown when ordered and proposed for finance between 1st April 2019 and 30th June 2019, registered and financed by 30th September 2019 through Toyota Financial Services on Toyota Contract Hire. Advertised rental is based on a 36 month customer maintained contract at 8,000 miles per annum with an initial rental of £2,994 +VAT. Excess mileage charges apply. You will not own the vehicle. Other finance offers are available but cannot be used in conjunction with this offer. Offer may be varied or withdrawn at any time. At participating Toyota Centres. Toyota Centres are independent of Toyota Financial Services. Indemnities may be required. Finance subject to status to over 18s only. Toyota Financial Services is a trading name of Toyota Financial Services (UK) PLC; registered Office: Great Burgh, Burgh Heath, Epsom, KT18 5UZ. Authorised and regulated by the Financial Conduct Authority. Terms and conditions apply. Discover the benefits of Business Plus, download key tax information and see what existing Toyota fleet customers have to say. View the Toyota model range, tax incentives and key tax terms to consider when choosing your company car. As part of your fleet, Toyota Hybrids make perfect business sense. Discover Toyota's latest range of light commercial vehicles.